This roasted butternut squash is coated in brown sugar, maple syrup and seasonings, then roasted until tender and caramelized. The absolute best way to enjoy butternut squash! 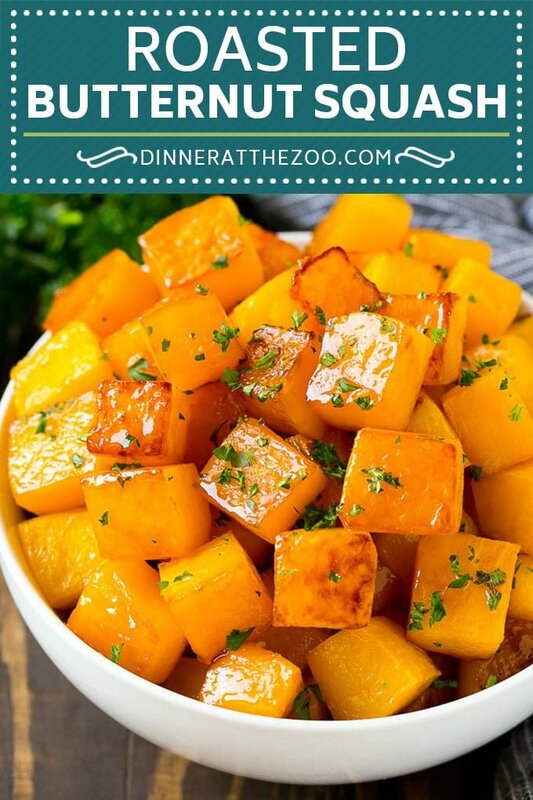 I always serve a vegetable side dish with dinner, some of my family’s favorites include glazed carrots, parmesan zucchini, and this lightly sweetened roasted butternut squash. When the colder weather months roll around and there are less fresh green veggies at the market, I turn to winter squash. Winter squash is inexpensive, readily available, and comes in all kinds of different shapes, sizes and flavors. My favorite winter squash is butternut, it’s got a ton of flavor and stands up well to most preparations. This roasted butternut squash gets a touch of sweetness from brown sugar and maple syrup, and is totally delicious. A butternut squash requires a little prep work before it’s ready to be roasted, but it’s totally worth the effort! The first step is to cut a thin slice off both the bottom and top of your squash so that it won’t roll around when you’re working with it. The next step is to use a vegetable peeler to peel off the skin. Use a sharp, high quality vegetable peeler to make short work of this task – I use a Y-shaped peeler. After your squash is peeled, you’ll want to cut it lengthwise, then use a spoon to scoop out the seeds. From there, you can cut your squash into cubes. This recipe also works with pre-cut butternut squash from the produce section if you want to save a little prep time. How do you make roasted butternut squash? 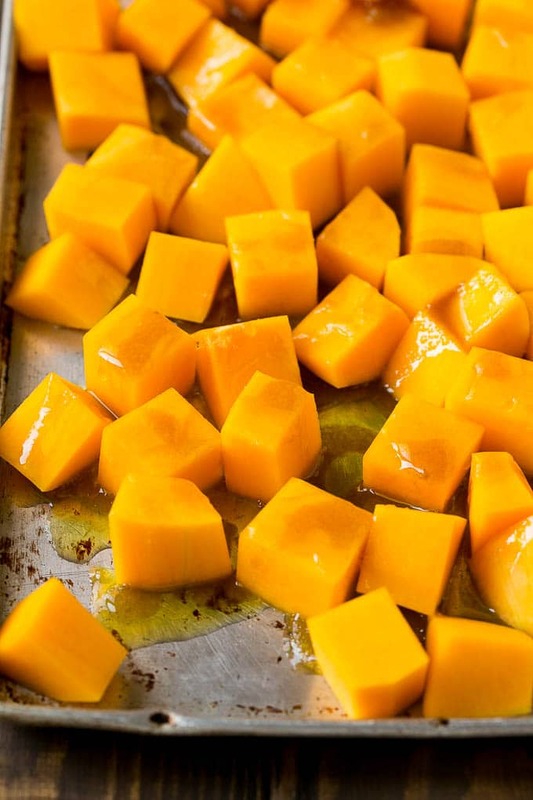 To make this recipe, you’ll want to spread your squash out in a single layer on a greased sheet pan. A mixture of olive oil, brown sugar, maple syrup and seasonings goes over the squash. 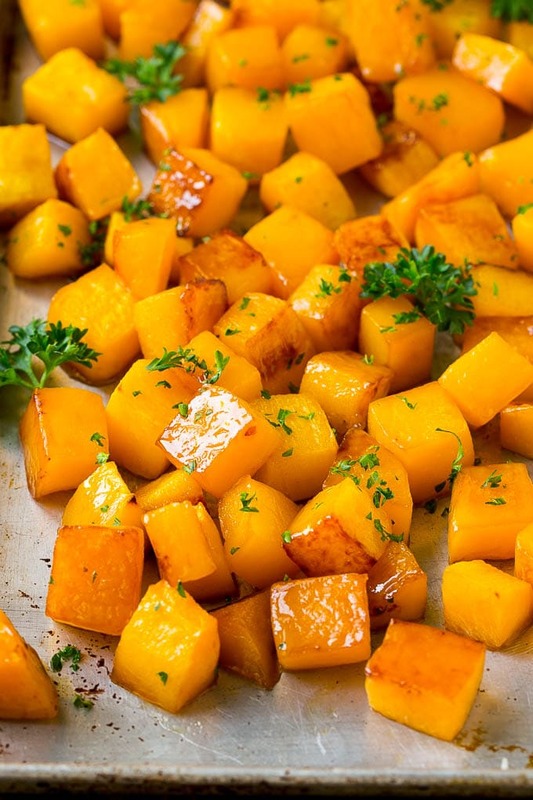 Place your squash in the oven and roast until it’s caramelized and tender. The finishing touch is a sprinkle of fresh parsley. I cut my squash into 3/4 inch pieces – it may seem a little large, but the squash shrinks down as it cooks. You’ll want to stir your squash occasionally to make sure all of the sides get caramelized and browned. Line your sheet pan with foil before you coat it with cooking spray for easier clean up. I like to garnish my butternut squash with a little chopped parsley, but you could skip that step if you prefer. 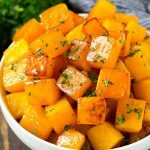 I love this sweeter version of roasted squash, but there are so many different ways to switch up the flavors in this recipe to suit your tastes. Bacon: Add 1/2 cup cooked crumbled bacon before serving. Garlic and Herb: Omit the brown sugar and maple syrup, and instead add 1 teaspoon of minced garlic and 1 teaspoon of Italian seasoning to the olive oil. Red Onion: Add 1/2 cup sliced red onion to the pan before the squash goes into the oven. Cinnamon: Add 1/2 teaspoon cinnamon to the olive oil mixture. 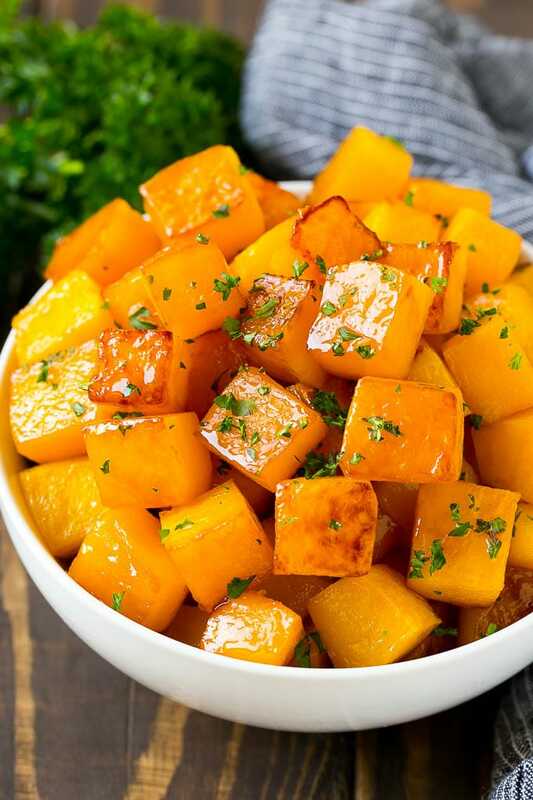 While roasted butternut squash makes a great side dish, it can also be used in a number of other dishes such as salads or in pasta. The possibilities are endless! Preheat the oven to 400 degrees F. Coat a sheet pan with cooking spray. 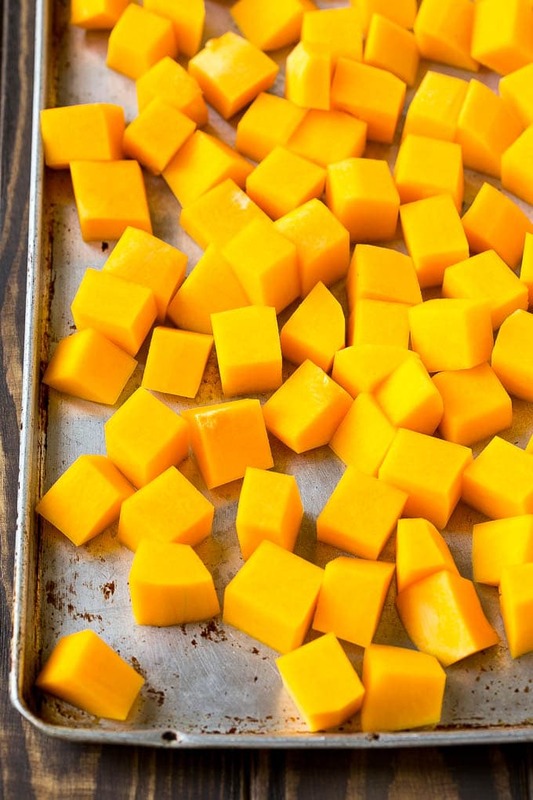 Arrange the squash cubes in a single layer on the pan. In a small bowl, whisk together the olive oil, brown sugar, maple syrup, salt and pepper. Drizzle the olive oil mixture over the squash, then toss to coat evenly. Bake for 25-30 minutes, stirring every 10 minutes, until squash is tender and browned. Sprinkle with parsley if desired, then serve. Oh I love butternut squash it is yummy and something all the kids enjoy too!! I’ve never made butternut squash before. I bet it’s really good with the brown sugar on it. So simple, yet so delicious! I love roasted butternut…yours came out absolutely perfect! Mmmmm this sounds amazing! I love anything with squash. The brown sugar I’m sure would make them even more sweet. Butternut squash is one of my favorite additions to dishes. I usually use it more during the fall though. I am just so in love with roasted butternut squash. i’ll bet the brown sugar makes this just amazing. Great recipe! I think I can prepare this, the guide is easy to follow. This looks nice, thanks for sharing. This is an awesome way to prepare butternut squash. I really look forward to making this. 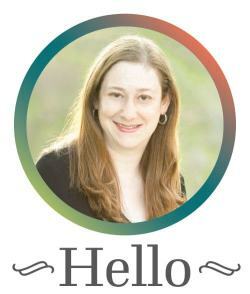 I am a big butternut fan! It is so delicious and always make want some more. I do need to try your variation of making roasted squash. Thanks for sharing! 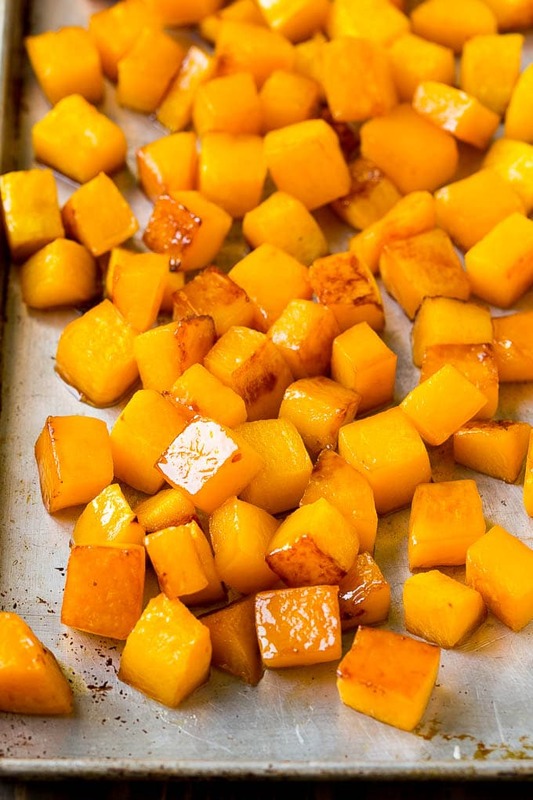 Butternut squash and brown sugar go together like peanut butter and honey. Yes, honey. Try it. This sounds so good. I can already taste the sweetness mixed with the nutty, smooth texture of the squash. Thank you so much Jan for the nice comment, it makes me so happy to hear you’re enjoying the recipes! I hope you like this one too!